Appletreewick is a small village in a comparatively quiet backwater in one of the most beautiful parts of Wharfedale, 5 miles north of Bolton Abbey and 2 miles from Burnsall. The picturesque houses, some of which date from the 12th century with interesting architecture, mostly overlook the only through road, and are set on the hillside above the river with dramatic long distance views over the Dale with the fells in the background. Early records and registers show that there were, in addition to farming, many occupations in the village including blacksmiths, cobblers, weavers, tailors, schoolteachers, innkeepers, corn millers, carters, and miners. Sometimes called "Aptrick" by locals, the southern Dales village of Appletreewick may be small but it is brimming with character. Named in the Doomsday Book, the village flourished during the early part of the 14th century and was a key market location. It has grown little since, with barely 250 people calling it home. The Appletreewick lead mines are long abandoned and were high up on the hills behind the village, and were a major source of employment in the area. Records show that there were 72 miners in 1865 and indeed many of the houses would not exist had it not been for lead mining. The mines became uneconomical when cheap imports of lead started coming in from abroad. This closed all the mines in the dales, and often the villages became ghost villages due to the lack of employment. A walk down Appletreewick's main street is like taking a step back in time as the road is lined with stunning 17th and 18th century stone cottages. There's even a classic British red telephone box, which is something of a rarity these days. Despite its diminutive size, Appletreewick is a hive of activity during the summer months as hikers and cyclists flock to the region to take in the views across the fells and the moors beyond the River Wharfe. The area is not as rugged as many other Dales, making it a great place for walking and cycling that is enjoyable without being too strenuous. After a day taking in the sights, there is a mountain bike livery where you can keep your cycle secure overnight for a small fee. The site also has changing facilities and tools available for making on the spot repairs. Also Mountain Bikes can be hired from the livery behind the New Inn to explore the area and the century with interesting overnight accommodation, holiday accommodation and camping is available. It is probably best to ask at the pubs or go onto their websites. The area abounds with interesting and varied walks examples being along the side of the River Wharfe (part of the Dales Way), up on the hills and fells, through the dramatic Trollers Gill which is the haunt of the Bargueest (a huge wild dog with saucer like eyes which was the inspiration for the Hound of the Baskervilles by Conan Doyle) and the more adventurous can also climb Simon’s Seat and its craggy summit rising to 1,925 feet and which dominates the eastern skyline. The River itself is also something of a draw when the sun is shining as its banks are a great place to relax or have a picnic. There is a rock pool with an island in part of the river which some visitors like to wade out to. A plethora of wild birds nest in the trees close by and if you're up early enough you can enjoy their dawn chorus. The local village pub is called­ The New Inn and offers welcome hospitality and meals after the days walk in the local area. Day tickets for fly fishing on the River Wharfe are available from Masons Campsite, where you will find a good abundance of brown trout and grayling. Those pubs also double up as bed and breakfasts so if you need a place to stay after your meal then you will not have far to travel (vacancies permitting). Other accommodation available in Appletreewick includes a number of quaint holiday cottages and the large campsite located at the northern edge of the village. The most famous son of Appletreewick is William Craven, who was born in 1548 to a paupers family in a cottage opposite the High Hall, now the site of St. John’s Church. The vicar of Burnsall got him a job in London and the young boy in his teens got himself down to London on carriers carts and joined the firm of Merchant Tailors which he worked his way up in and eventually owned. He produced all the fabrics for the funeral of Queen Elizabeth the first. He started a bank and invested in shipping and eventually became Lord Mayor of London in 1610. After that he returned to Appletreewick, restored the High Hall, created the road to Burnsall, built Burnsall bridge, built the beautiful Elizabethan Burnsall School, and restored the church. It is calculated that his estate in today’s terms when he died in 1618 was worth 8 billion pounds, and yet he set off from Appletreewick with nothing! He was knighted and his descendants became the Earls of Craven. His coat of arms and his portrait can be seen in St. John’s Church and in the Craven Arms. The extensive, beautiful and romantic gardens of Parcevall Hall created by Sir William Milner are only a mile from the village and are well worth a visit together with their onsite tea room. Appletreewick is a very special village and we feel sure that you would enjoy a visit. We need your help - send us any local information, anecdotes, photographs of your village! Set in the picturesque village of Appletreewick, with views overlooking the River Wharfe, The New Inn is a charming country public house and restaurant, which includes 6 en-suite bedrooms if you want to stay overnight. The bar and restaurant are in the traditional country pub style with comfortable seating and log fires in both areas, a bonus during a cold Dales’ winter evening. The food and service is excellent and there is a good selection of beers and other drinks. For the warmer months, it has an excellent beer garden with the same great views of Wharfedale. All are welcome at The New Inn, including dogs and their owners, horse riders and cyclists – at the back of the inn is The Mountain Bike Livery, which offers mountain bike tours and other services for mountain bikers. From feedback submitted by our followers, the only pub and restaurant we would recommend in the immediate area is The New Inn. Please send us details of any local information for Appletreewick - we will post them here. 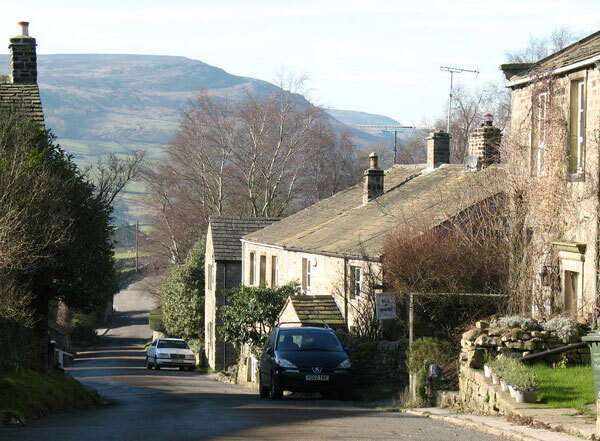 The village is on the number 74 bus route between Ilkley and Grassington, but travelling by car is recommended as services only run during certain parts of the day. The nearest train station is located at Skipton around eight miles away while Leeds Bradford Airport is situated 21 miles to the south west. Please send us details of any local travel information for Appletreewick - we will post them here.